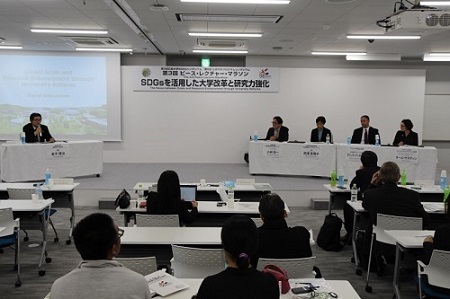 On December 1, “The 2nd Hiroshima University Symposium on SDGs” was held at Hiroshima University Higashi-Senda campus. 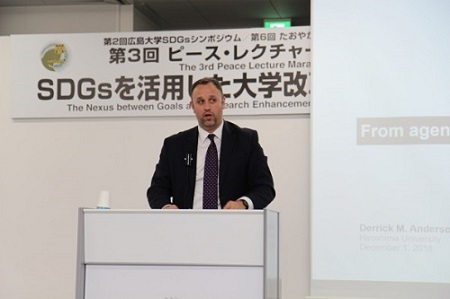 The symposium with the theme of “The Nexus between Global Goals and a Research Enhancement through University Reforms”　included keynote speeches and panel discussion. 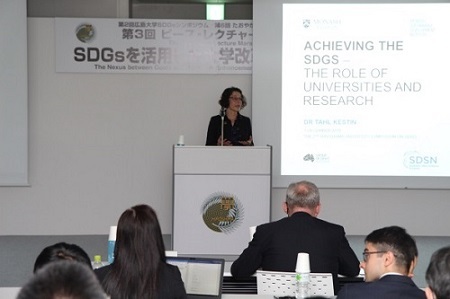 While local governments, universities, companies and research institutions have taken action to achieve the 17 Sustainable Development Goals which were adopted at the United Nations General Assembly on September 2015, Hiroshima University also aims to contribute to achieving SDGs under the new long-term vision “SPLENDOR PLAN 2017” to be a university of world-wide repute and excellence for 100 years into the Future.